This is a moment in Itzik Ashkenazi’s current life. He never intended to be a chef, he tells me, as he talks about how he makes fresh pasta. An electrical engineer by training, he was on duty on a beautiful October day in 1990 on his base near Rosh Pina. Suddenly, his left leg was shattered by friendly fire. Itzik was rushed to Rambam Hospital. Fortunately for him, the skillful surgeons who operated on him saved his leg. His recovery would not have been complete had it not been for the contributions of the Friends of the Israel Defense Forces, and American non-profit organization dedicated to Israeli soldiers’ well-being. Physical therapy and other amenities sponsored by the FIDF helped rehabilitate him. Only an orthopedist would know I was ever injured now,” he tells me. An unexpected result of the process of healing from the pain and trauma of this injury was that Itzik transformed himself from an electrical engineer into one of Tel Aviv’s most passionate chefs. Once he was honorably discharged from the IDF, Itzik needed time to finish healing. He couldn’t just accept the responsibility of working full time as an electrical engineer somewhere. He decided to help out in his family’s restaurant, Il Pastaio (The Pasta Maker). His Italian-born mother started Il Pastaio in 1988 as a store selling freshly prepared pasta. Located in a Bauhaus building circa 1939, it was the only place in Israel where fresh pasta was made in the traditional Milanese way. As the store became more and more successful, Itzik’s family decided to hire an Italian architect to design the the first floor interior to be an authentic, northern Italian restaurant. Initially, Itzik helped out with the business side of the enterprise. But he still had to heal from his injuries, both externally and emotionally. Itzik reached deep inside himself for what he truly loved. He felt the call to be creative with food. Itzik learned how to prepare fresh pasta at the feet of the master: Enzo Dellea, a famous Northern Italian chef and cookbook author. The sensual experience of mixing flour and eggs, kneading the fresh dough, and inhaling its earthy aroma helped repair Itzik’s internal emotional trauma. Nurturing hungry people with delicious, artisanal food filled him with joy. As part of his healing process, Itzik discovered his true passion. As he became more accomplished in the kitchen, he reached into his family’s Jewish heritage from Rhodes. Itzik’s aunt, Matilda Koen-Sarano, wrote a cookbook in Ladino called Gizar Kon Gozo or Cooking with Pleasure. From this book, he shares with us a recipe that combines his love of preparing fresh pasta with a traditional Sephardic dish called travados, or as he calls them affectionately, travadikos. The Ashkenazi family prepares travadikos to celebrate Rosh Hashanah. 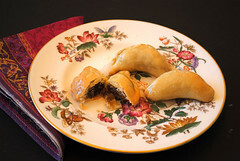 “Travadikos are a mezza luna (half moon) of fresh dough, filled with a mixture of ground nuts. 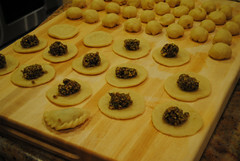 The filled dough is baked, and then simmered in honey syrup. Travadikos taste a lot like baklava,” he explains to me. Mix all the ingredients for the dough together. Allow the dough to rest for two hours. Mix the ground nuts and sugar. Mix all the ingredients for the syrup in a pot over a low flame. Stir until a golden syrup forms. Keep warm. Preheat the oven to 356 degrees Fahrenheit. Using a wine glass, cut out circles of dough. 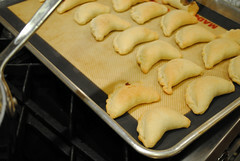 Place one teaspoon of filling in each circle of dough. Fold the dough in half over the filling, and pinch shut to create a mezza luna (half moon). Bake the trovadikos for 30 minutes. 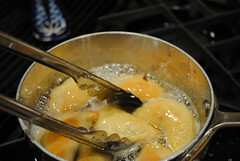 Remove the trovadikos from the oven and simmer in the syrup for a few seconds. Remove the trovadikos with a slotted spoon and place them on a large serving platter. Garnish with a dusting of ground nuts mixed with sugar. During his hospitalization at Rambam Hospital, Itzik discovered that one of the missions of the FIDF is to rehabilitate wounded soldiers. They do this through their Strides Program. “I am very, very fortunate,” Itzik tells me. “My friends who were injured during combat carry invisible injuries,” he says. “They can’t sleep at night. I wish I could help them find something to move them away from what happened to them during their military service.” As Rosh Hashanah, the time of “teshuvah, tefillah, and tzedakah,” arrives, please consider helping repair these soldiers’ lives with a contribution to FIDF. Your gift may even help discover a new culinary genius! I would like to extend my special thanks to Beit Halochem for connecting me with Itzik Ashkenazi. Ronit Treatman, joined the Philadelphia Jewish Voice in April 2009 as a food writer. In 2010, she became its food editor. In 2013, she was elected president of the Philadelphia Jewish Voice. She was born in Israel, and grew up in Ethiopia and Venezuela. Ronit graduated from the International School of Caracas and is fluent in five languages. She served as a volunteer with the Liaison to Foreign Forces Unit of the Israel Defense Forces. She has a B.S. in international business from Temple University. Ronit is the creator of Hands-On Jewish Holidays. Click here for her earlier work for the Philadelphia Jewish Voice.